Lavender Freshwater pearl stud earrings, pearl size is 9-10 mm, round pearls, FRESHADAMA quality, mounted on solid 14k gold posts. Yellow or White gold. 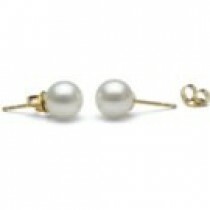 Natural Lavender Freshwater pearl stud earrings, these pearls have perfectly round shapes, pearl size is 9-10 mm. The pearls are FRESHADAMA quality, that means the best quality of all Freshwater production. Brilliant luster, flawless surface, perfectly round pearls, only 0.01% of the total Freshwater worldwide production have these factors of very high quality. Freshadama pearls are the world's highest-quality freshwater pearls.